To better predict the effective energy performance of buildings in cities, this study addresses the modelling of local external radiative, thermal and aeraulic conditions. After reviewing existing modelling approaches that are suitable for estimating the building boundary conditions in energy simulation, this paper analyses external conditions derived from a building energy model (BuildSysPro) or a microclimatic model (SOLENE microclimat). Comparisons are made for the different faces of a generic building standing alone or located in an urban environment, with or without a thermally efficient envelope. When the modelling approach is adjusted, the results highlight significant deviations on the estimated radiative temperatures and wind-based quantities around the isolated building. When accounting for surrounding buildings, the results show a substantial reduction in short-wave radiative fluxes, which is explained by an imbalance between solar masks and multireflections, and a reduction in the wind-driven ventilation potential. The authors warmly thank Jean-Luc Hubert and Maya Milliez from EDF R&D and the BHEE for their support during this work, as well as the CRENAU laboratory for providing SOLENE microclimat. Merlier L, Frayssinet L, Johannes K, Kuznik F (2019). On the impact of local microclimate on building performance simulation. Part II: Effect of external conditions on the dynamic thermal behavior of buildings. 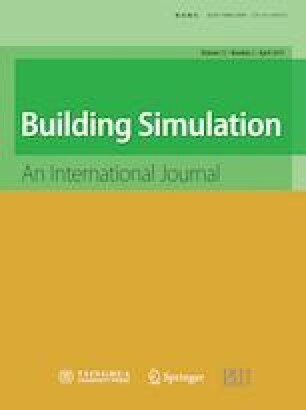 Building Simulation, https://doi.org/10.1007/s12273-019-0508-6.